Creating the perfect interior design won’t be a problem anymore. Take a look at these accent furniture ideas! If you work in the interior design industry you know what it takes to transform a living space – accent furniture. The bold detailing and unusual aesthetics are perfect to enhance any ambiance or style. If you follow Luxxu, you might already know that our team never gets enough of extravagant, luxurious items. And although minimalist design is probably one of the biggest trends right now, we still stick to our values of designing sumptuous furniture items. Today we want to inspire you to design passionate spaces, and for that you must use proper accent furniture to facilitate the whole process. A statement Sidetable can truly make an impact to a living space. 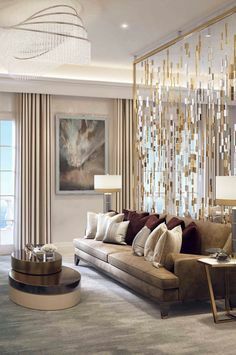 Make sure to choose strong metallic colors like gold or silver and place it below a lighting pendant or wall lamp to create a more opulent aesthetic. This trick not only adds functionality to the space but also provides a passionate look. An accent lighting item can do wonders to any interior design, yet it’s important to ensure some balance with other furnishings. We advise you to place an explosive suspension right above comfortable upholstery. This will create a sensational mix between different textures. Add an elegant sidetable and a patterned contemporary rug to finish the look. Mirrors are perfect to decorate walls. You can also use artwork yet we believe the functionality and elegance of a mirror can surpass even the greatest of paintings. Place decorative items for a creative touch, add a colorful velvet chair and finish up with a cozy rug. Marble flooring needs to be enhanced by some elegant curtains and accent items. There’s no way you can deny this. And if there’s one piece of furniture that can make a difference is a console table. Storage and beauty all in one, don’t be scared to play with different designs when purchasing this item. Make sure to enhance it with a high end mirror design and stool. Be prepared to blow the minds of your clients and guests away.